Home / Blog / Email Marketing / Newsletters, Welcome Emails, and Latest Post Notifications: Which One Should You Use? Newsletters, Welcome Emails, and Latest Post Notifications: Which One Should You Use? If you’ve used MailPoet (and we hope you have!) you’ve no doubt created and sent an email or two. If you haven’t, that’s okay too! Everyone needs to start somewhere – and this post is a good place to start. In MailPoet, there are three types of emails: newsletters, welcome emails, and post notifications. What are the differences between the three? In this post, we’ll cover each type of email, what it can (and can’t) do, and when (and when not) to use them. Let’s get started! In MailPoet, Newsletters are simply one-time emails, also known simply as “emails” in everyday human English. They aren’t complicated; you design them and then click send. That’s it! Newsletters are only sent once. If you want to send a newsletter more than one time, you’ll need to duplicate it and send it again. If you want to send a one-time email. Have a special sale this month? Want to make an announcement to your subscribers? Opt for a newsletter. If you want to send a really personal email. Since a newsletter is only sent one time, that means your subscribers will perceive it as being individualized and personal. Latest Post Notifications and Welcome Emails, on the other hand, are automated and will be probably be perceived as such by your readers. If your WordPress posts are sporadic and not on a specific schedule. In other words, if your weekly or monthly newsletter isn’t predictable enough to schedule on a particular date or day of the week, go with a newsletter. If you want to schedule a single newsletter for a specific date. Want to send an email on June 24, 2018 at 10:00 a.m.? You can do it with a newsletter. Almost any other reason. As we mentioned above, in MailPoet, newsletters are just standard emails. If you don’t need anything fancy, a newsletter will do the trick. Welcome Emails, also known as Autoresponders, are just that – they welcome your new subscribers (or new WordPress users) to your list. You can choose to send them immediately or a specific amount of time later: hours, days, or weeks after subscription. Welcome Emails are perfect for courses, walkthroughs, and other “drip” content. In fact, we use Welcome Emails for our own MailPoet Welcome Course – sign up for it here. (Want to create your own email course? Check out our guide.) Welcome Emails are also great for sending gifts like eBooks or other products to your subscribers after they join your list. We have a guide on that too! Protip: Welcome Emails tend to have dramatically higher open and click-rates than other types of emails. While 25-30% is a solid open rate for Newsletters, Welcome Emails will often get open rates of 50% and above. If you want engaged users. Needless to say, everyone should have a welcome email that goes out 1-2 days after subscription. It’s a great way to introduce your readers to your newsletter content. If you’re creating an email course for your subscribers. In MailPoet, it’s easy to set up welcome emails that are sent immediately or X hours, days or weeks after subscription. your users. Welcome Emails are great for coupons, especially if you’re trying to get users to join your list. If you want to send an eBook or other product to your subscribers when they sign up to your list. Sending freebies is a great way to grow the size of your list. Check out our guide to doing this. If you want to create a welcome or on-boarding program. 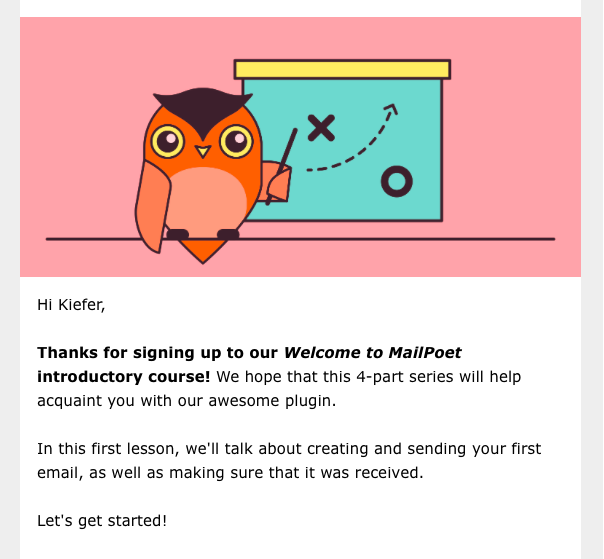 Our MailPoet Welcome Course functions as an on-boarding program and uses Welcome Emails. Looking for more tips on writing a good Welcome Email? Yep – we’ve got a post for that. Once a day at a specific time. For example, every night at 7:00 p.m.
Weekly on a specific day at a specific time. For example, every Thursday at noon. Monthly on a specific date at a specific time. For example, the 3rd day of every month at 6:00 a.m.
Protip: keep your post count to under 10. These days, with mobile phones and short attention spans, who has time to read novel-length emails? If you must have a high number of posts in your email, consider using List View. If you want to save time and send your content out automatically. Want to send your latest blog posts to your subscribers as soon as you hit “Publish”, without having to manually create a new Newsletter? Latest Post Notifications can do it. If you want to send an automatically-generated listing of your posts in the last day, week or month. If you want to send a “reminder” or wrap-up of a past month. For example, you can send an email on the last Friday of every month that includes all of the previous month’s posts. Still have questions about Latest Post Notifications? Give our fancy new video a watch. In short, the Automatic Latest Content (ALC) widget lets you automatically add the latest content to your newsletter. You can choose which posts, pages, or media to add to your newsletter (and how many of them.) You can also include (or exclude) specific categories or tags. If you click Display Options, you’ll find a whole host of other customization options. Note that in Latest Post Notifications, the ALC widget will only show content that hasn’t been sent previously – not the number of posts/pages that you’ve selected. 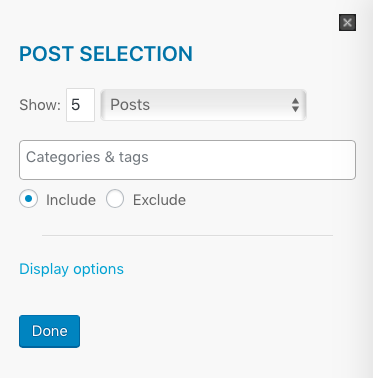 For example, if you’ve chosen to include 5 posts in your Latest Post Notifications email, the widget will not include a post that you’ve already sent in the group of five newsletters. In Newsletters and Welcome Emails, however, it will always show the number of posts/pages that you’ve selected. 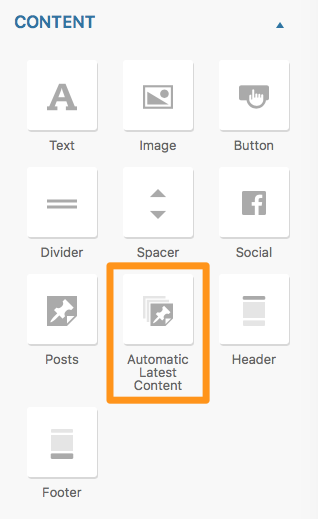 Still have questions about the Newsletter Designer and the Automatic Latest Content widget? Check out our Knowledge Base guide. That about covers the differences between Newsletters, Welcome Emails and Latest Post Notifications! Still not sure which type you should use? Ask in the comments and we’ll be sure to help. Did GDPR Just Kill Abandoned Cart Emails? I just moved from mailpoet 2 to mailpoet 3 and I’ve found a nice improvement in design and services. Congratulations! Although, I’m really disappointed to learn from your Support Service, that it’s not possible to receive an email notification after each registration and welcome email to my email info@felicinamore.it! For me email notifications are absolute necessary because it’s the way to know in real time that a client is waiting for a service. If I do not receive the notifications I loose clients and services I could give! Please think it over seriously about this matter. Shouldn’t you do it, I ‘ll feel obliged to choose an other autoresponder supplier and stop to pay the premium mailpoet version. I look forward to receiving your answer as soon as possible. and after 2 months, this very important feature is not yet ready…! Hey Dev’s, please do something!